There is an apartment search site called “Zumper.” Zumper has come up with a very smart marketing ploy, which is something they call a “National Rent Report.” The “National Rent Report” reports on how much rent is, nationally, in a bunch of different cities and neighborhoods. People like to know how much other people are paying for things, compared to how much they are paying, and they like to get updates about the course of neighborhood change, and that sort of thing, so the “National Rent Report” gets picked up by media outlets all over the place. 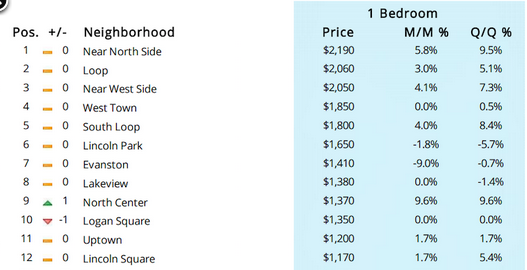 The median one-bedroom apartment in Chicago does not go for $1,780. 2. There can be more than ten neighborhoods, but half of all the one-bedroom apartments in the city must be located in just five neighborhoods. Neither one of these things is true. Rather, the issue is almost certainly that half of Zumper’s listings are in one of those five neighborhoods, because their listings are very, very concentrated in high-end apartments. But that makes their listings completely worthless for determining the actual median rent for the rest of us, who live in a world that is not bounded by Zumper’s database. Which makes the “National Rent Report” completely worthless. Let’s all stop writing about it. I’ve long wondered about those astronomical median rent numbers, do they include rent-controlled apartments, or just market-rate ones? If the share of rent-controlled apartments is around 45% in NYC and 73% in SF, that’s a huge, potentially distorting factor. You know, this data problem is only an issue to the data-oriented urbanists who read things here and on other blogs, even my own. And we’re right about the shortcomings. But that doesn’t change the fact that Zumper is defining the city the way their market defines the city — a small, affluent subset of a much larger city whose balance is irrelevant to them. They don’t care about the rest of the city, until its changes are favorable to them. I hate the Zumper report. I can only speak for Chicago, but it is completely meaningless. It’s not just Zumper. Craigslist, Padmapper, Domu, and other sites have a huge paucity of listings from the not-so-affluent South and West Sides. In these neighborhoods, most apartments are rented through word of mouth, For Rent signs, or even old-fashioned newspaper listings. Learned this the hard way when looking for a place in Pilsen.